What is it about the new year that makes me want to purge, organize, refresh and start in a new direction? Or maybe its just the realization that I've lived one more whole year with a nagging problem that makes me say "That's it! No more. Time to do something about this!". Uhm, yeah. I admit it, I've been keeping this dirty little secret from you all. This is one part of the front entry makeover you never saw, right? But we all have a few secrets, don't we? Its not like I haven't tried to keep this mess under control. I've just had a few things working against me. The layout of this closet renders it almost impossible to keep it neat and tidy. It has an angled door and its too small to put a shoe rack in their properly. Instead of a rod, there are hooks around the perimeter. Now you can see why we end up with piles of coats on hooks and piles of shoes on the floor! I think seeing all that winter gear stuffed in there helped me reach my boiling point. So one day while the babe was down for a nap, HandyMan and I tore everything out and turned this closet into something more functional and neat. We started with a good cleaning, some patching, and new quarter round to hide the cable. A few coats of white paint freshened everything up. Then we took the existing Ikea shoerack and cut it down to fit. Now we have a space for those tall winter boots. We removed all the hooks and added a hanging rod. Coats hang on the right and umbrellas hang on the little area in front of the bumpout to the left. We kept the existing shelf overhead but I added baskets for hats and gloves. Now with the coats hanging properly, I can actually reach the shelf! On the door, I put this pretty hanger-thingy from HomeSense. Its the perfect spot to put Chloe's little coats. The kiddo woke from her nap before we were able to finish everything so we'll have to leave installing a wall-mounted shoe rack and some hooks for my bags on the left wall for another day. But for now, its good enough... and I don't have to worry about an avalanche of coats toppling on me anymore! Do tell, do you have any shameful secrets hiding in your home? Oooh! It looks so much better. Good work! You would think here that there would be more emphasis on the size and need of a front hall closet ...boggles me , I just did our as well , makes a huge difference. I like that coat hanger thingy! I'm embarrassed to say we have a few closets like this at our house. But we're working on it! The best part of that closet makeover is the spot you created to hang umbrellas! They never end up having a good place to be, do they? And I especially love how you used the space you had, and its limitations to your advantage. I'm inspired! We recently created a closet in our master bedroom that we have yet to complete... our clothing storage (laundry baskets scattered around the room) is currently our secret (not so secret) shame. Now I have your closet to cheer me on to the finish line! I love an organized closet. I'm going to take some of these ideas for my entry closet. The houndstooth hanger is so cute, especially with the colorful little coats hooked on it. I can 100% relate.. the joys of living in an older home! Your closet was a haven of neatness compared to my shameful coat closet. I've been working on redoing that closet. All it's waiting on is a new light fixture for me to call it done. I love the door hanging thingy that you used for Chloe's coats. It's ingenius and pretty, too. what an improvement, Jennifer! Clever storage for Chloe's coats. Makes you smile every time you open the door, right? 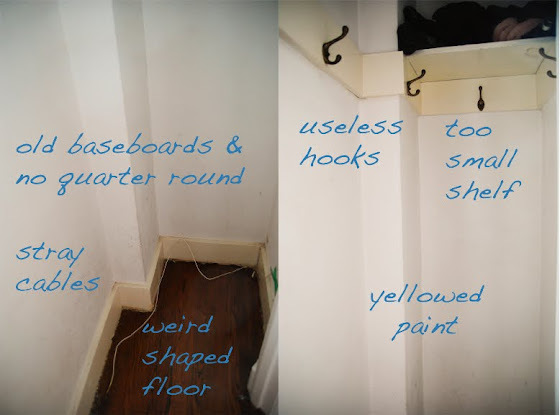 Closets and old house - ugh! We only have two upstairs and they are so narrow we can't even hang a hanger in them sideways. Everything is squeezed in on an angle. Damn Victorians! It looks wonderful! I totally understand the need to organize and purge in the new year. I have been on a streak in our house. We tackled the basement of shame in our house but we still have a long way to go. I may post about it when it is all done....hopefully soon! Nice work, that is the most awkwardly shaped closet I've ever seen. Great job on that awkward shaped closet! Feels good to get rid of visual clutter as well. Check out 10 Rooms today were a few of us bloggers participated in The Great Clean Out! I love a good before and after. This one was wonderful! I love what you guys came up with, and hope to see more as you add the finishing touches. ha, my closet looks surprising similar to your before photo! This year we definitely have been trying to work on the little details that got left out of our first year plus of home reno. Thanks for the reminder that a little project no one sees can make a huge difference! Looks great! The only weirder closet I have ever seen is my brother's coat closet which is about 9" deep and has hooks on the wall - there is NO WAY you could put a bar in no matter how you turned it. So weird. Isn't it rewarding to get a closet all cleaned out? I find it completely amazing how much stuff we can shove in there ... and we never really know until we take it out to clean things up. Your closet looks much more functional. Great for the psyche, isn't it. Your closet isn't shameful any longer, and your plan for hanging bags ext. will be a terrific final addition! Our front hall closet definitely needs some help. This is an inspiration to get that project rolling! Well done!our entry closet is a corner closet, so I feel your pain!! Although, to get a closet / entry way at all in an old home is a feat in itself. Great job. Awesome! I love the way it turned out. You got so much stuff neat and organized in that little closet. I love how you even use the little bit of rod left for the umbrellas! All my closets are shameful. Did you guys use the term "walk of shame" in college? One of my favorites. What a great makeover, its so much more useful now! Seriously that closet looks familiar. Great post. Well done. I need to tackle mine as well. It really only needs a few things done to it, but it would function so much better if I did them.